Out Of House Publishing will be exhibiting at the annual meeting of the Society for Scholarly Publishing in Boston, May 31st to June 2nd. 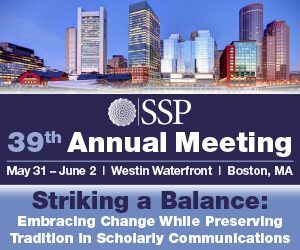 We’ll be in Boston to meet with customers old and new, to hear about current production challenges, and to support the good work of the Society for Scholarly Publishing. It would be great to meet with you or a colleague during the conference. Sign-up here to arrange a meeting.